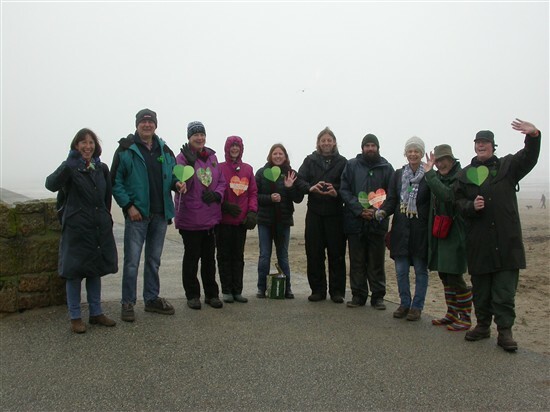 Staff, volunteers and friends of Cornwall Reserves (including Zennor WI and Cornwall Beach Rangers) put their best foot forward and braved truly atrocious weather on Valentine’s Day to show their support for the Climate Coalition’s ‘Show the Love’ campaign. 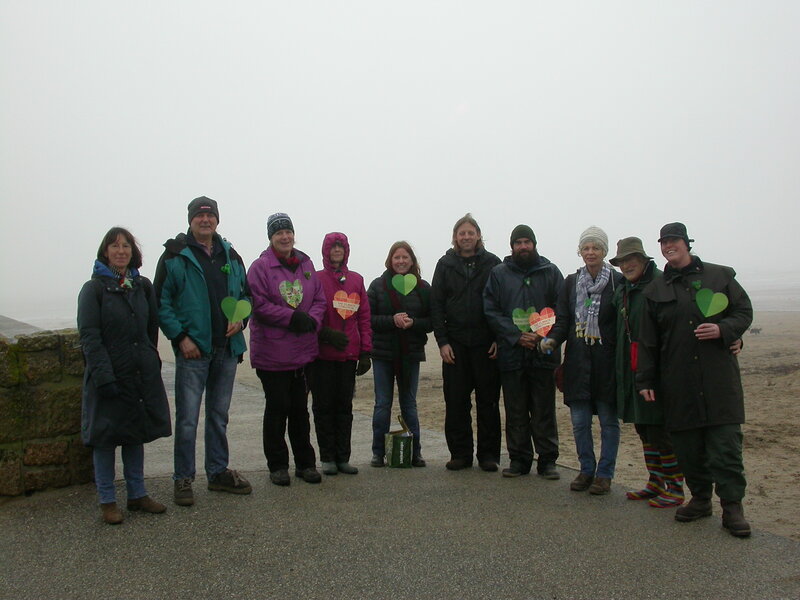 Armed with wet weather gear, cardboard banners and sporting handmade green heart badges the team took to Marazion beach for a photo opportunity and a chance to have a good chinwag about all things environment related. As the saying goes ‘the sun always shines on the righteous’ and bang on 12 o’clock the rain stopped, the clouds cleared (very slightly) and we had a brief respite to pose for photos and record some sound bites. Earlier that same morning, Warden Jenny Parker and Estate Worker Steve Cooper joined litter pickers from the Shore Beach Rangers group who had organised a beach clean event to celebrate ‘Love Your Beach’ day. 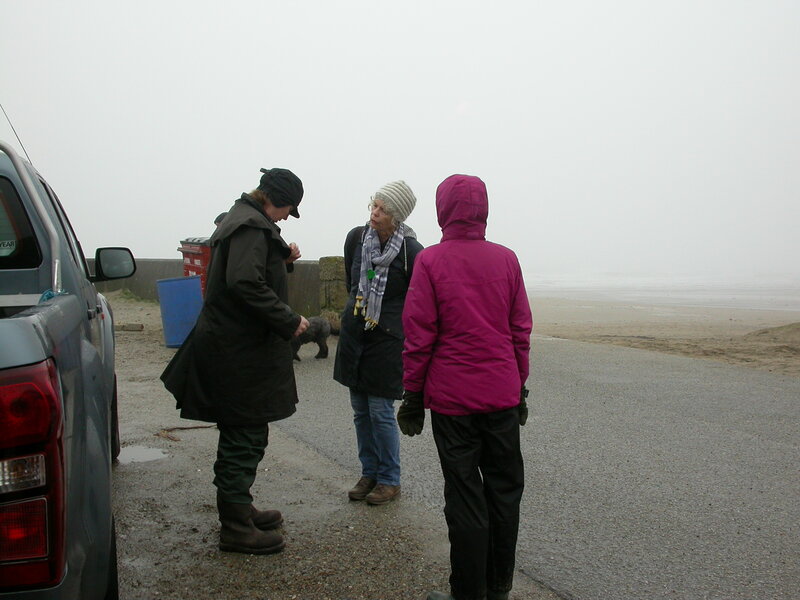 After a lively photo session and a chat with some local dog walkers the heavens decided once again to make their presence felt so we retired to a nearby hostelry for a well-earned coffee, a good natter and the chance to be once again harassed by Jen Parker and her ubiquitous camera! 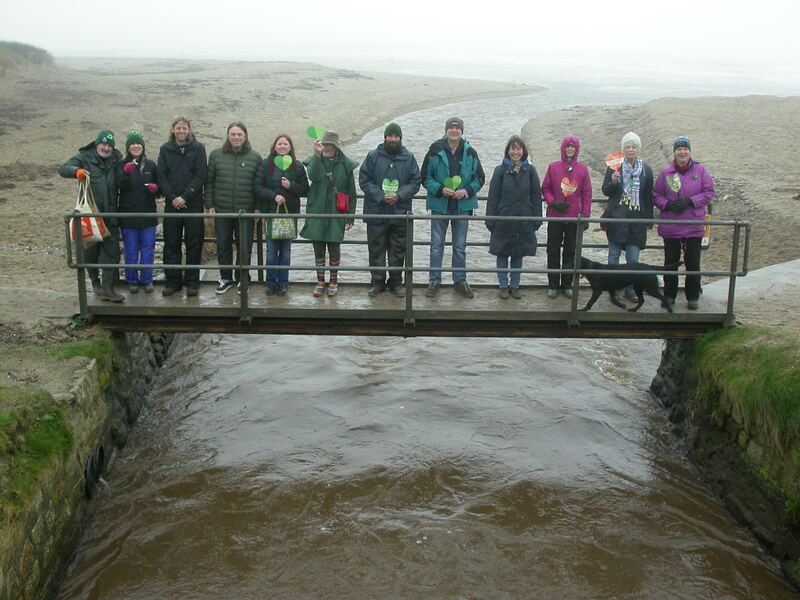 The campaign occurs every year around Valentine’s Day and is organised by the Climate Coalition of which the RSPB is a member. ‘Show the Love’ is a chance for people to come together and highlight issues around climate change. By focusing on the things that are important to us as individuals it helps us to see the wider issue of climate change. It could be a threat to chocolate or coffee production, the cancellation of a sporting event or noticing seasonal anomalies in your garden. This in turn helps us to relate to the bigger picture of disappearing sea ice, extreme weather events and dying coral reefs. The campaign is very social media led and every year appears to take on a life of its own with groups across the country from the WI to Wildlife Trusts, Schools to Scout groups posting photos and information about events they’re holding. Each year the campaign is getting bigger and its influence is being felt across a wider audience. This year green hearts were once again everywhere........sported by politicians, celebrities, conservationists and activists alike as well as many of us lesser mortals. Our lunchtime gathering threw up some lively and sometimes heated debate, highlighted a few climate change myths which were duly discussed and debunked and offered many hints and tips about ethical and sustainable living in our modern world. All too soon it was time to wipe the cappuccino foam from our top lip and head outside blinking into the sunshine (well ....the mist and light drizzle – this is Cornwall after all). We all returned to our lives hopefully a bit better informed and a lot more enthusiastic about making positive changes.